The title of this fantastic and intoxicating album is a dead giveaway. La Clave del Gumbo bestraddles the two not-so-disparate worlds of Cuba and New Orleans. In the album plots a sort of pentangular map of the rhythmic topography that was laid out at the bottom of North America and the northern tip of South America. Here the Caribbean met New Orleans; Congo begat Congo Square and Guantanamo and Camagüey, met Kingston, Jamaica, and met the Dominican and Puerto Rico. Clave reigned supreme and laid the indelible imprint upon the region. It made the subverted all other rhythms and created a music so compelling in its ideas, evanescent, weightless trills, suspended and overlapping harmonies and became the sheer dynamic power of the continent as to speak forcefully and eloquently for itself. Call it the rhythm of the second line, the mambo and rumba, and the guaguancó of the descarga, the dropped syllable of reggae and calypso, the bomba, the plena, the spirit of the African diaspora in the Americas. Or call it like it is: La Clave del Gumbo. 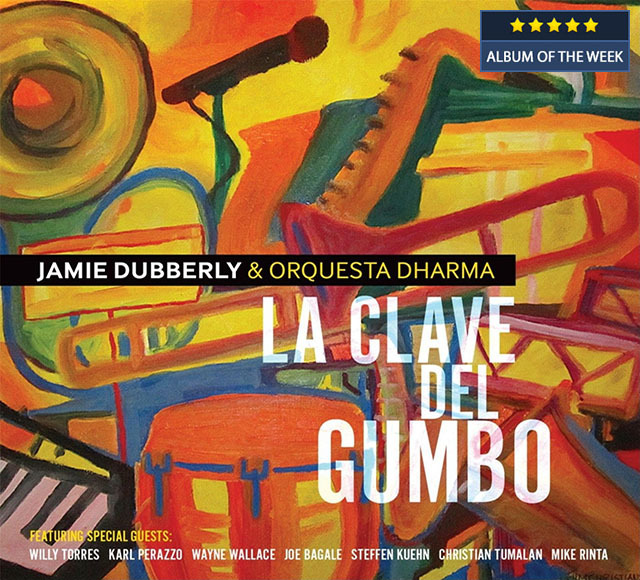 Jamie Dubberly and Orquesta Dharma have got it right from the very first mystic chord of the disc, after the batá drums and the Braulio Barrera chant to placate the excited Orishas or Vocatives… the countries of the ancestors of the slaves of Dahomey and the Congo. And there are few things more exhilarating than when the drummers, pianists and brass and woodwinds get the groove going than mambo+bomba+plena+gumbo con alma, con una ebbrezza fantastica all of which = the rhythmic gymnastics; that of this record. There is no molly-coddling musicians here; just red-hot unbridled energy; sunbursting quantum packets of energy in the inexorable growling of tuba and in the earth-shattering braying of the trombone and the roistering of all of the other instruments of this fantastic orchestra. It is called, I believe, “nailing it”, which is to say getting it from the first notes of the explosive first chord. Why name any particular song when the entire album is an explosion of rhythm adorning inebriated melody and harmony? This is a disc that, end to end, a molten mix of the hottest volcanic music with the coolest near chaotic joy. Jamie Dubberly has also managed to seduce some of the biggest names in the business to join him in paying homage to his muse: African-Caribbean and African-American music results in a new kind of ode to joy. The malleability of rhythm and fiery spontaneity coalesce in a thoroughly personal style of playing. This results in music that captures all of the luminescence, impulsive power, fluidity and shimmering mystique of the saints of the music, who have in turn, inspired Orquesta Dharma. This is, quite simply, one of the most irresistible tributes to the music that begat it all. 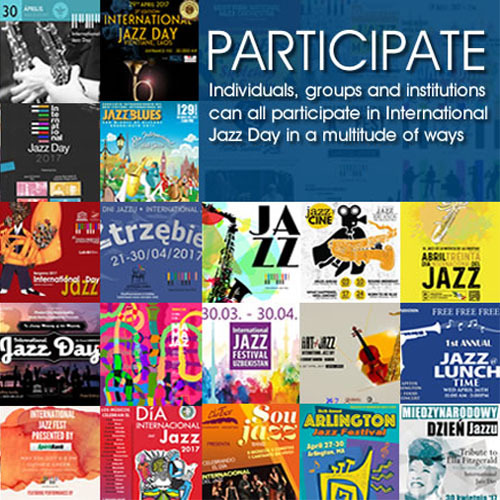 Track List: Jazzy; Don’t You Worry ‘Bout A Thing; La Esencia Del Guaguanco; West Side Story; Mambo Pacific; Soul Provider; Sonando; It Ain’t My Fault; I Don’t Need Nobody Else. Personnel: Braulio Barrera: vocals (1, 3, 7, 8), güiro; Steffen Kuehn: trumpet (1); Jamie Dubberly: trombone, chants, hand claps; Pete Cornell: tenor saxophone; Charlie Gurke: baritone saxophone (1, 3-6), chants, hand claps; Darren Smith: baritone saxophone (2, 7-9); Mike Rinta: tuba; Andy Nevala: piano (1, 6-9); Fred Randolph: bass (1, 6-8); Omar Ledezma Jr.: timbales (1, 4, 6, 7, 8), vocals (7); Javier Cabanillas: congas (1, 2, 3, 4), güiro (1, 5, 6, 7, 8), bongo (6), tambourine (6, 8, 9), chants, hand claps; Christian Pepin: bongo (1); Camilo Molina: batá drums (1); Silvestre Martinez: batá drums (1), congas (5, 8), bongo (7); Brian Andres: drums (1, 2, 4, 8); Joe Bagale: vocals (2, 9); Wayne Wallace: trombone (2); Christian Tumalan: piano (2, 3, 5); Abo Gumroyan: bass (2, 9); Willy Torres: vocals (3); Sam Bevan: bass (3, 5); Karl Perazzo: timbales (3, 5); Carlos Caro: bongo (3, 5, 8), congas (6, 7, 9); Ramón Garcia: vocals (8); Brian Kendrick: drums (9).